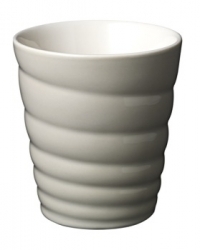 The sensuality of steaming hot drinks and a good grasp of design is implicit in Kahler's new thermal cup. At the same time, Spiro is a tribute to the beauty of conches. The ingenuity is immediately retrieved in Spiro's spiral design, which is inspired by the vigorous and yet exquisite appearance of the conch. Just like the snail shell, Spiro is modeled around an outer shell whose insulating quality protects and keeps the inside warm, thus ensuring complete coherence between the shape and function of the thermal cup. The transparent and rich glaze is characteristic of Kahler ceramics, and Spiro's colours appear intense and inviting.